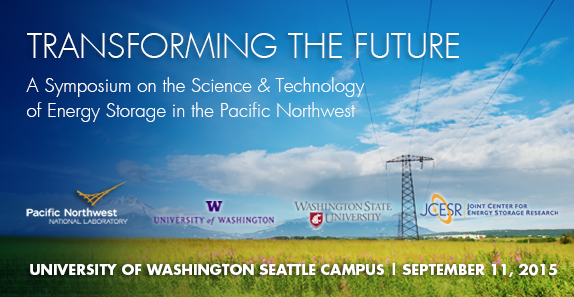 Friday, Sep 11, 2015, 8 a.m. – 5 p.m.
Advanced energy storage technologies hold the potential to transform the energy economy of the Pacific Northwest and the United States. Recently, GTM Research named Washington and Oregon to a list of “five states where energy storage could thrive.” What makes the Pacific Northwest an innovator in energy storage? How can the Northwest capitalize on its resources to become a global leader in energy storage research, technology and commercialization? Pacific Northwest National Laboratory, the University of Washington, Washington State University, and the Joint Center for Energy Storage Research (JCESR) will host a regional symposium to explore the Pacific Northwest region’s many energy storage opportunities, capabilities and challenges. JCESR is a U.S. Department of Energy research partnership that integrates government, academic, and industrial researchers from many disciplines to create new breakthrough energy storage technology. This event will provide a forum for industry, utilities, researchers, and policy makers to discuss energy storage from science to application in the Pacific Northwest. The symposium will address several key questions about the potential for wider deployment of energy storage technologies in the Pacific Northwest, including: energy storage research needs; commercialization opportunities and challenges in the Pacific Northwest, and strategies needed to finance energy storage technology deployment. Invited speakers and panelists from regional utilities, state and federal government agencies, entrepreneurs, university and national laboratory researchers, and policy makers will collaborate in a highly interactive one-day session of networking, panel discussions, exhibits, demonstrations, and dialogue. A reception the evening before the symposium will offer additional networking opportunities and a student poster competition will provide visibility into research topics in chemical and other forms of energy storage, and their applications.